There is a large area of land close to where I live that is soon to be developed. Word is there will be over five hundred apartments on the site – yes, five hundred. Knowing the area, my mind boggles at all those people living at such close quarters but space is an increasingly rare luxury when it comes to inner-city living and I’m sure plenty of families will choose this prime spot by the Yarra River. With apartment living comes a number of storage challenges, particularly for things that would ordinarily be left in the garage, like bikes. 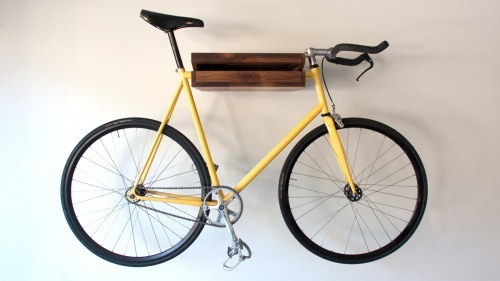 The idea for the Bike Shelf came to designer Chris Brigham when he was visiting friends in New York, where bikes crowded the hallways of apartments. 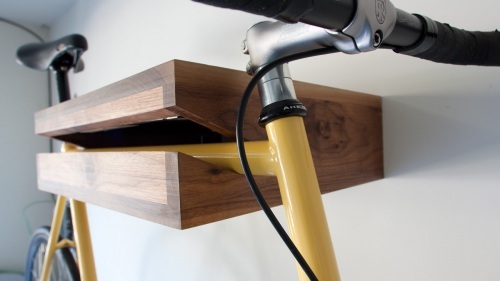 Seeing the need for “elegant bike management”, he came up with the Bike Shelf. A graphic designer by trade, Brigham turned his keen eye to furniture design with stunning results. Focusing on custom made pieces to fill particular needs, Brigham’s furniture is simple, modern and understatedly elegant. 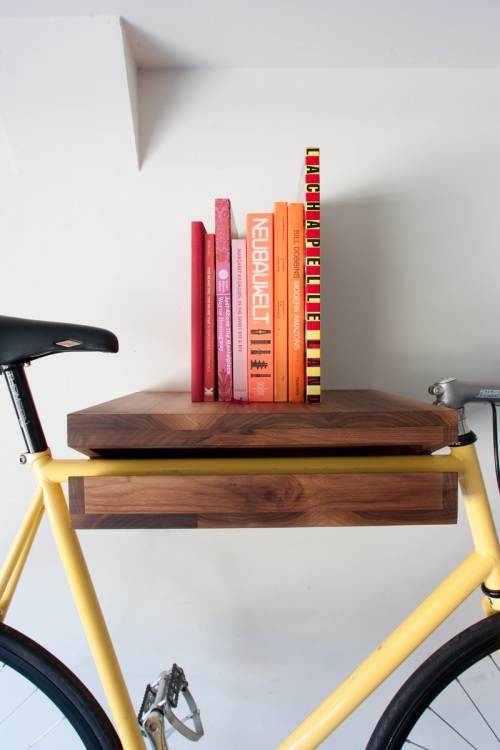 Made from solid wood and suspended by a solid steel mount, the shelf can hold both your bike, as well as anything else you want on it. Given the number of beautifully designed bikes on the market, it seems only sensible to showcase them on a mount that is as equally beautiful. Brigham is based in the US but is currently investigating international delivery of his bike shelf. The shelf is US$300 in Walnut or US$270 in Ash. Contact Knife & Saw directly regarding shipping to Australia. While visiting Knife & Saw, take time to look at Brigham’s other designs, including the superb cot and change table he made for his new baby son.